As businesses move increasingly online, it has become more important than ever to make sure your paper management and workflows are efficient. According to a recent survey by Xerox Corporation in conjunction with Coleman Parkes, 99% of businesses still report that paper processes are integral to their business, they just want to manage it better. IBISWorld estimates that architectural services revenue will grow by 2.6% per annum over the five years to 2019-20, reaching $7.3 billion annually. People responsible for managing the finances and workflows for these businesses will be under increasing pressure to optimise efficiency and establish internal processes and operations that make architects and other design professionals more responsive to this increase in demand. Advancements in scanning software make the modern scanner the solution of choice for many small businesses. Distinct from multifunction devices or copiers with scanning capabilities, stand-alone scanners such as the DocuMate 4830i offer powerful software packages that turn hard-copy documents into electronic files that can be effortlessly and more safely archived, edited and shared with other offices, clients and partners. There is no denying that the vast majority of business documents today – bills, invoices and contracts for example – are A4 or letter-sized. However, architects are unique; documents like building plans, technical drawings and diagrams are critical business assets, and rarely fit on a single A4 sheet. From document management to advanced image capture, this blog is intended to help you make an informed decision about choosing a scanner that offers more advanced software features for your business, and how it can help you become more efficient and productive. 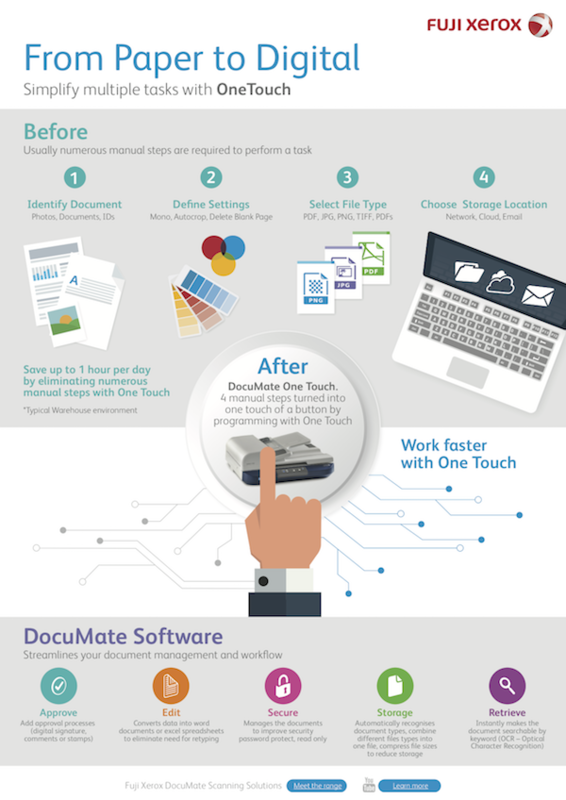 Imagine how much time could be saved if you had important documents, at the tip of your fingers when you needed them? For architects that means technical drawings, plans and schematics. But it also includes invoices, bills, receipts, picking slips, purchase orders, HR documents, personnel files, and contracts. PaperPort software which is programmed into many A3 scanners provides the easiest way to turn paper into organised digital documents that everybody in an office can quickly find and use. It then helps you to manage them along with all other electronic documents in one convenient and easy-to-use filing system. PaperPort’s large, clear item thumbnails allow you to visually organise, retrieve and use your scanned documents, including Word files, spreadsheets, PDF files and even digital photos. Meanwhile its Scanner Enhancement Technology tools also ensure that scanned documents will look great while the annotation tools let you add notes and highlights to any scanned image. Why Spend More For An A3 Scanner? It’s little surprise that an A3 scanner will cost you more upfront when compared to an A4 scanner. But you’re not just buying a bigger device, you’re buying a more advanced device. A good A3 scanner will deliver more advanced requirements such as high-speed batch scanning, high sheet intake, double-feed and stapled paper detection. The price difference between A3 and A4 scanners depends on its model, but the additional cost of an A3 scanner can be offset but its superior productivity, speed and reliability. Visual clarity is essential to the architectural industry. Small details and creative flourishes can be lost if your scanner doesn’t adequately capture the complexity of your drawings and plans. That’s where software like Acuity is especially important for your next A3 scanning solution. With the use of advanced algorithms and dynamic thresholding, Acuity aims to improve the visual clarity of every document that you scan. This technology enables your scanner to instantly correct documents containing imperfections, it improves the overall quality of scanned images, increases increases OCR (optical character recognition) accuracy and most importantly saves you time. Fuji Xerox has launched its Solutions Assist service dedicated solely to helping small businesses choose, install and use any scanner from our DocuMate scanning range.